First up are the air drying clay decorations we made. 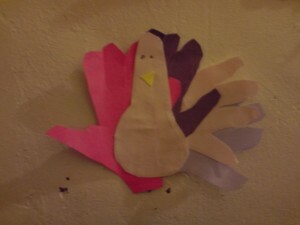 We cut these out last week, left them to dry thoroughly and decorated them on Friday. I think they’re really gorgeous. They’ll looking stunning hanging on Christmas trees. 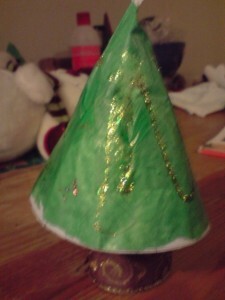 Next we have the Christmas trees the kids made, again this craft was done over a few days. They’re really simple and very effective. 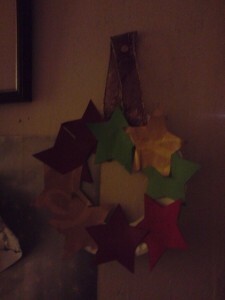 Again they can be made by recycling bits and bobs around the house. It was great to see the different approaches the children took – the one below was decorated with a green glitter pen to give the effect of tinsel. 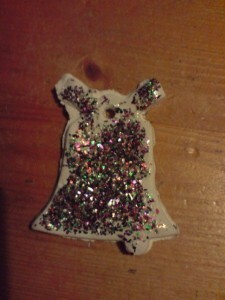 Whereas this one has foam shapes and sequins stuck on to look like baubles. On Friday we wrapped up very warm to go for a walk to admire the houses decorated with Christmas lights. 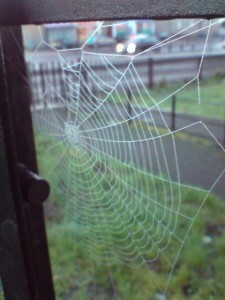 It was a beautiful frosty, foggy evening and as we stepped out of the front door we spotted a creation to rival any Christmas decorations. Stunning. It’s a shame that the camera hasn’t captured the gorgeous beads of frost which caught the light and glittered like tinsel. The children were captivated! It’s still there and every evening we take a moment to admire it. I’ve only got two more days with the children before we separate for the Christmas holidays. The next two days we’ll be spending dancing like dafties to Christmas songs and watching Christmas DVDs so there won’t be any more updates until after the holidays. I hope all my readers (and I know you are out there) have a wonderful Christmas and a Happy New Year. Anyone looking at this wondering about childcare – click on Contact Me and give me a ring. I look forward to hearing from you! 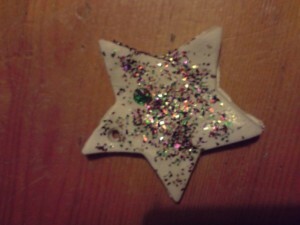 We are up to our eyeballs in glitter and pva glue crafting our little socks off. 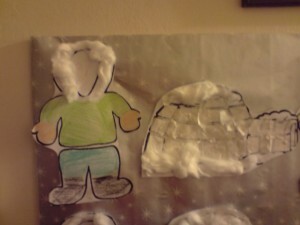 Expect an epic post tomorrow which will showcase the finished crafts which we’ve been working on over a few evenings. 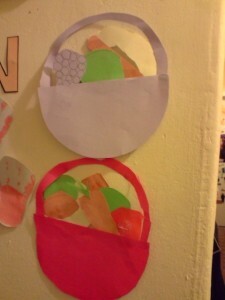 For now just enjoy the beautiful Christmas Wreaths the children have made. These are very environmentally friendly as we recycled old Christmas cards, wrapping paper and ribbon from a box of chocolates which my Grandmother got for Christmas last year! 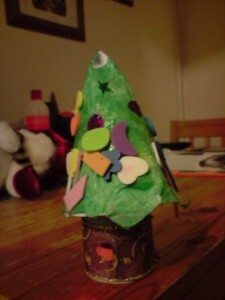 I think this is one of my favourite crafts I’ve done with the children. It’s so simple and really cute! 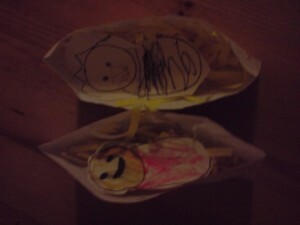 Here is the little baby Jesus asleep in an envelope manger, nestled on a bed of shredded yellow paper. These are the best kind of snowballs. No numb fingers, soaking wet gloves and snow traipsed through the house. 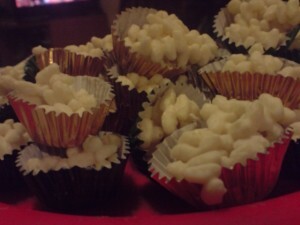 Rice crispies stirred into melted white chocolate, rolled into a ball and popped into a petit fours case (or “thae wee cake cases” as my hubby calls them). It is well and truly baltic here! 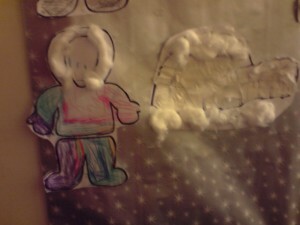 So of course we’ve marked the season with some igloo and inuit crafts. We’ve also been out looking at the sky as we have enjoyed some beautiful clear evenings. It’s been a joy to go out in the evening, all wrapped up against the chill and gaze up to the stars. The moon has been full and bright and we’ve even seen The Evening Star – Venus! Last week in the USA it was their festival of Thanksgiving. We talked about the Pilgrims and what it would have been like to leave your home behind and sail off to somewhere unknown. 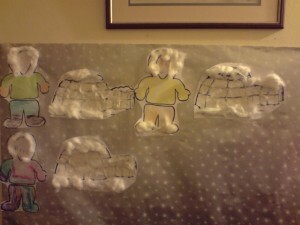 The children decided it would be very scary and that the pilgrims were very brave. I see the king refusing my plea. I see the Mayflower ready for sea. I see a new land to set me free. I see a hard winter, tough as can be. I see a green bud on a spring tree. I see an Indian helping me. I see corn growing 1, 2, 3! I see praise, for thankful are we! 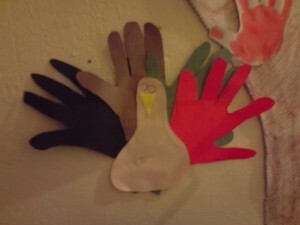 We also had lots of fun making Turkeys – the traditional Thanksgiving bird – from handprints and adding them to our harvest baskets on the Autumn display.